For more in the Visual Schedule Series, see this series of posts. 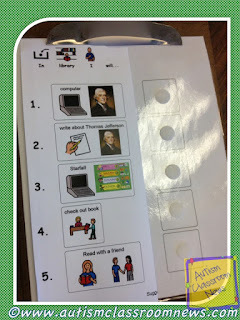 As promised, in this post I want to talk about the importance of using visual schedules, and visual supports of all kinds, everywhere the student goes. I wanted to focus on this issue because over the years I have seen many instances in which there are lots of visual supports in the resource classroom but as soon as the student leaves the resource room for PE, recess, or any other reason the visual supports stop at the door. If you think about it, this doesn’t make any sense. In the resource or self-contained classroom the routine is predictable and set, the people are consistent and there are few surprises. Outside the more self-contained environment there are more people, more changes in routine, and more factors that can create anxiety. So these are the times when a student needs MORE visual support, not less. Think about how much support your student needs in a self-contained classroom and then increase the amount of support you provide when he leaves that environment. Also, for students who participate most of the day in the general education environment, that is a pretty difficult environment to navigate for someone with difficulty with communication and social (not to mention sensory) needs. So, again, more supports are needed across the day. To help with that, I wanted to highlight some examples of visual supports we have used to provide that type of support. 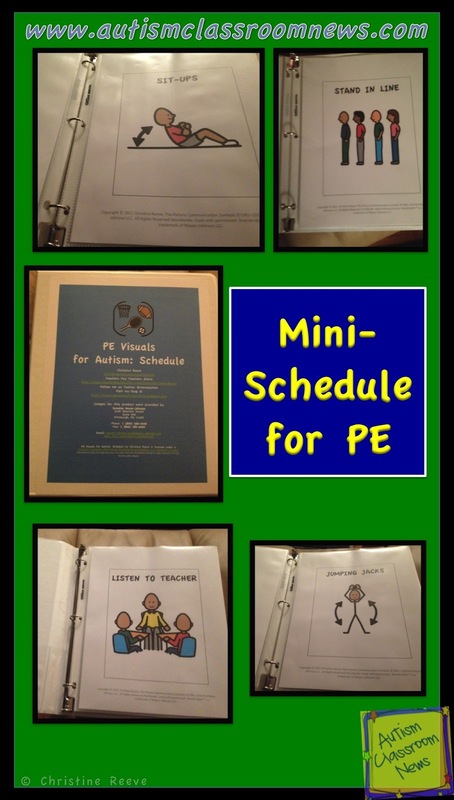 The picture at the top is a set of schedule visuals I made and sell through my Teachers Pay Teachers store to help PE teachers provide visual supports in structuring their classrooms. One of the things that is difficult about “specials” like PE, art and music is that the teachers serve a number of classrooms and have limited time and sometimes resources to make the visual supports and arrange them for a classroom. These are designed to be printed and put in page protectors. Then they can be put in a notebook and rearranged as needed. 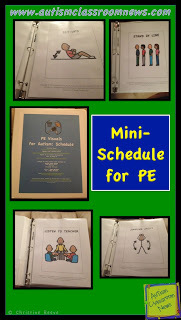 You can read more about the schedule for PE on this post, for art on this post, and for music on this post. Or click on my icon for my TPT store to your left to check them out in the store. 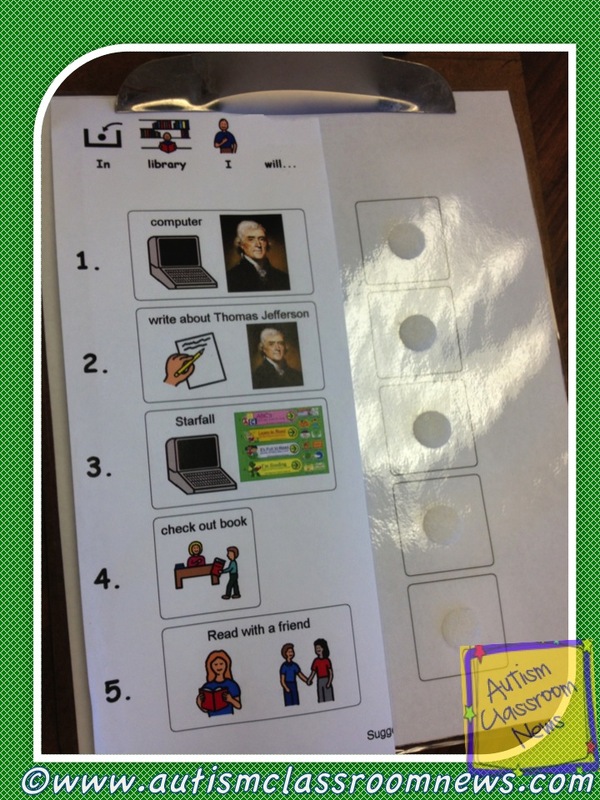 The picture to the right is a schedule a teacher made to support a student during library. It takes him through the steps of the activity that he is expected to complete. He has to use the computer to research an historic figure, then write about what he learns, then he can play on Starfall, check out a book and read with a friend. This schedule serves to help him engage in the expected activities, to know what the expectations are, and to know when he gets to do what he wants to do. This helps avoid the repetitive “What’s next?” or “When can I ___?” questions that a lot of students ask when they are unsure of time and sequence of activities. 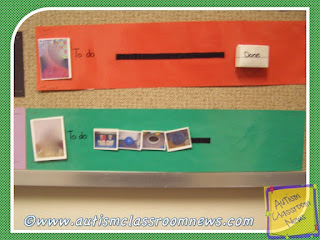 The picture on the left is a schedule for the OT room. Many students take breaks to the sensory room or OT area but often times it’s a free time that results in more challenging behavior because the students don’t have enough structure. 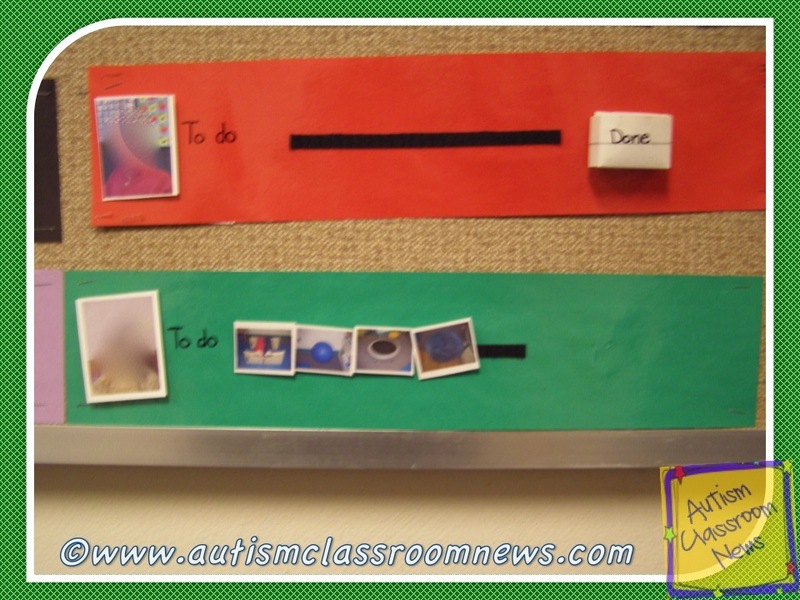 This OT had structured her room so that there was a schedule of activities that the students needed to follow. 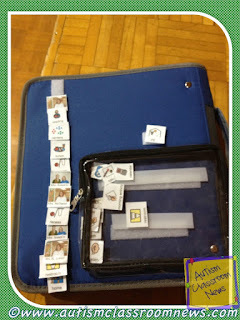 She set it up so that the staff could easily put the schedule together and could choose activities from ones that would help the student get more active or less active and then had a calming routine before leaving the room. 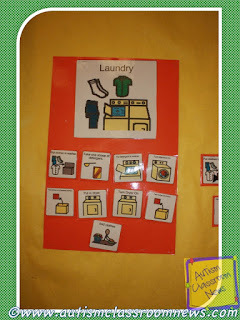 This picture (on the right) is a great example of how visual supports can be used at home as well as at school. This is a routine for doing the laundry. 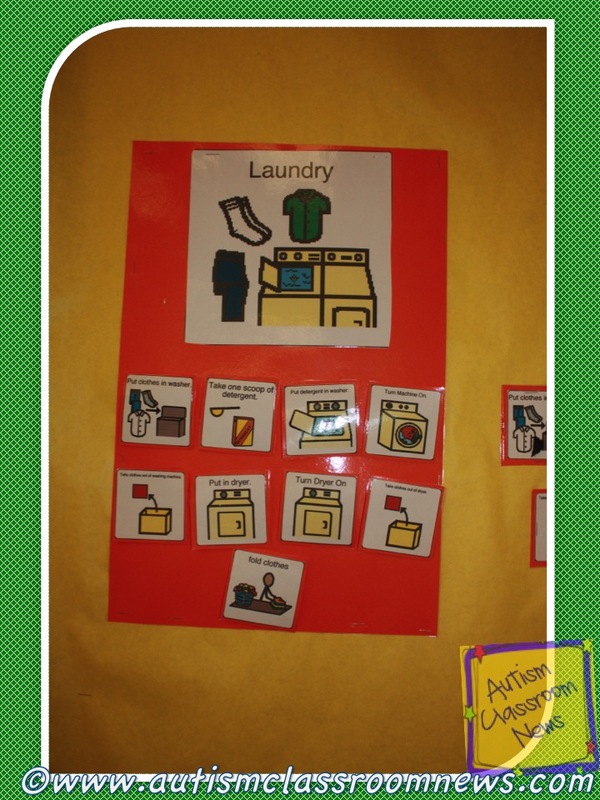 It’s a task analysis of the steps that allows the individual to do the laundry independently and can be easily be posted in the laundry area of a classroom or a house. On the left is a somewhat unexciting visual but it was very functional for the student. It’s a schedule for work and community-based instruction. It takes the student through the different jobs he is supposed to do and the community settings he is going to. 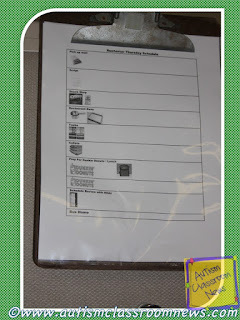 It’s on a clipboard that can easily be carried, but some students may use a notebook or an agenda for the same purpose. iPhones and iPod Touches can also be used with the reminder or the calendar app to set up a schedule as long as they are not distracting to the student. And finally, one of the challenges that I see classrooms having is how to organize all the materials. This teacher developed a Trapper Keeper that contains visuals, data sheets, a timer, token board, and first-then board inside it. 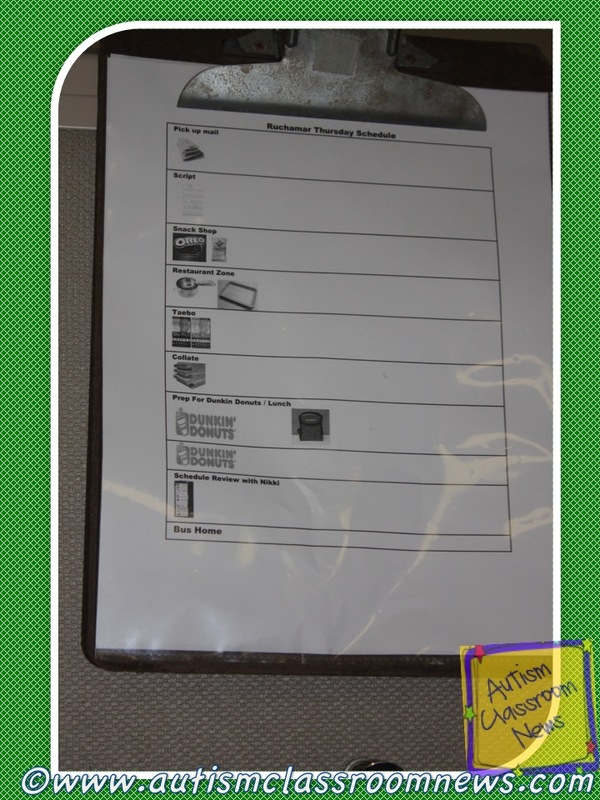 The student’s daily schedule is on the outside of the notebook with Velcro and he takes the visual off and puts it in the transparent bag when an activity is finished. He carries it around the school himself and it provides the supports needed for him as well as for the staff. And finally, the leisure schedule freebie that I posted on Friday has visuals in it that you can use to make a recess schedule. Recess in particular is a time that is often difficult for students with ASD or other behavioral challenges. It requires social skills and ability to structure time with play activities. Many times schedules can help to structure this time to help them know what to do instead of walking the perimeter. You can download the leisure visuals at my TPT store. So, how do you use mini schedules outside of your classroom? Any great ideas to share on how to organize them to be portable? Please share!